BRUSSELS, Belgium -- The recent decision by Ukraine’s Constitutional Court to cancel the amendments made to the Constitution in 2004 took many by surprise. With the political system rever­ting to the 1996 Con­stitution – a Presidential system of power – alarm bells have begun to ring with claims of democracy being rolled-back and a return to the Kuchma era. However, it is worth recalling that the changes made in 2004 were rushed through without proper consultation and in clear violation of legal and democratic procedures. This resulted in heavy criticism both from Ukrainian political parties and international institutions including the Council of Europe and the European Parliament. Indeed it was very much a trade-off undertaken when Ukraine was teetering on the brink of collapse. The parties involved decided to repeal the results of the presidential run-off and set a third round of elections. As a precondition, it was agreed that whoever became the new president would shed part of the Presidential powers to the Parliament. Unfortunately, the result of these changes was the creation of a dysfunctional hybrid system of governance. The increased stability, and prosperity promised by President Yush­chenko, and longed for by the West, never materialized. Ra­ther, within a few months, Ukraine spiraled into chaos with conflicts throwing the country into political deadlock. Ukr­aine’s political elites turned the smallest political matter into a make-or-break issue with endless bickering, never-ending elections as one government after another collapsed; bitter conflicts with Russia and inconsistent reform efforts. Ukraine was simply a political circus. Therefore it is little wonder that in January 2010 the Orange flame finally burned out and Yuschenko’s rival, Viktor Yanukovych and his Party of the Regions took over the Presi­dency. 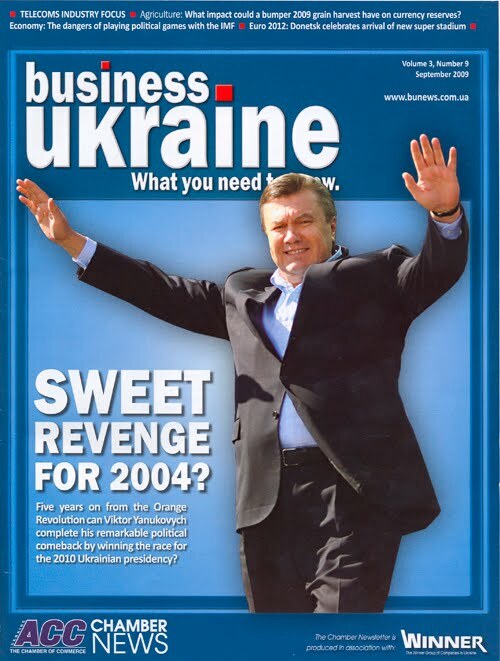 So how can we be sure that Yanukovych will not abuse his new powers – particularly given his history as a close ally of the Kremlin with a taste for power - and where is the guarantee that the return to the 1996-2004 political model will be more successful than in the 1990s and early 2000s? Clearly there are no water-tight guarantees and when Yanukovych first took up the Presidential reins little hope was expressed that he would deliver on his election promises: carrying out political and economic reforms and progressing Ukraine’s relations with the EU. Most people were expecting him to quickly get back into bed with the men in the Kremlin. And while he has mended fences with Russia (some would say the extension of the stay of the Russian Black Sea Fleet at Sevastapol was going to far) he has also made some choices, such as Ukraine’s decision to join the EU Energy Community, which are not exactly favourable to Russia. Furthermore, and quite surprisingly, Yanukovych already carried out more reforms than during the whole of Yuschenko term in office: creating a Committee on reforms, passing laws on state procurement and on the functioning of the domestic gas market, drafting a new tax code are a few. The economy is slowing recovering and ties with the EU continue to strengthen as Kiev progresses in its Association Agreement talks. Indeed, in the list of reforms requested by the EU, constitutional reform was always top and the EU, along with other international partners, as well as Ukraine’s political parties have consistently raised this issue for the past five years. While the the EU per se has no preference over the type of governance system, Brussels probably would have preferred the decision to have been taken by the Parliament and not the Court. Therefore, it is crucial that this will not be the end of the road for constitutional reform and that Yanukovych will initiate, as he promised, an inclusive process of constitutional reform with democracy continuing to be up-held. Ukraine is also not the same country it was in 2004 and it is highly unlikely the population would accept a return to an authoritarian regime. After-all thousands of Ukrainian’s did not stand out in the freezing cold with chattering teeth for nothing. There is also a strong civil society which currently excels at doing its most natural job – being vigilant and critical of those in power even though it is not always an easy task. And lastly Ukraine’s opposition will also continue to do its job with relentless attacks on the President, Cabinet and the ruling coalition. As to the question of the effectiveness of the presidency under the presidential-parliamentary system, it can be provided by staying focused and keeping eyes on the prize, which is to modernize the country, maintain democracy and freedoms and end Ukraine’s economic dry spell. Now it is up to President Yanukovych. He has a big opportunity. With his credibility at stake the world, as well as the citizens of Ukraine will be watching him and how he handles his new power.